It’s easy just call 1 (888) 443-8424 for a FREE 45-minute hair restoration consultation with Dr. Sean Behnam himself. You will also meet Stephen, a prior patient of Dr. Sean. You can look at his hair and feel how natural it is. Please read below for the different components of the consultation. Please also view our hair transplant pictures for men and women. Why do tons and tons of research when you can have the best hair transplant surgeon in Los Angeles at your fingertips to answer all of your questions or concerns? Call Now!! Before you commit to hair restoration surgery, we strongly suggest attending Dr. Behnam’s free hair loss examination. Dr. Sean Behnam will perform a thorough hair loss exam. Many patients do not need a hair transplant, and there are advanced treatments that Dr. Sean can prescribe. If a hair transplant is the best option, Dr.Sean Behnam will perform an extensive examination of the back of the scalp for quality hair that can be transplanted successfully. With over 2,000 procedures under his belt, Dr. Sean Behnam is an expert in Los Angeles in the field of hair transplant. He has dedicated his career to the highest quality hair restoration which is also affordable. Automation, advanced tools and modern equipment have been instrumental in creating hair transplant methods that are within his patients’ means. Class 3, thinning. This gentleman had 1,749 grafts placed in the hairline. This picture from side shows how thicker the left temple is. Class 3, thinning. 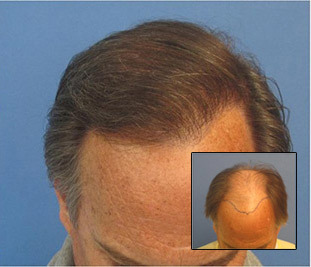 This gentleman had 1,749 grafts placed in the hairline. This before and after picture shows how thinned the frontal hairline is before the hair transplant and how thicker it got afterwards. Below are a series of frequently asked questions and answers that cover what Dr. Sean does during the examination. There are many aspects that make what we offer more than just a consultation – it is a hair loss examination. In our practice, you will always meet with Dr. Sean Behnam and he will personally examine your hair loss and answer all of your questions. Have a full hair transplantation examination done. Get the tough questions answered. Learn if you are really a good candidate. Learn the quality and density count of the hair in your donor area. What are the four stages of hair transplant examination? What is hair loss and hair transplant education? The meeting begins with our in house hair transplantation consultant Stephen who himself has been a hair transplant candidate of Dr. Behnam. Stephen will explain the basics of hair loss and hair transplantation. Example of before and after hair transplant. This patient had 2,515 grafts placed from the hairline up to the crown area. Before and after pictures are viewed and we thoroughly explain what we do to ensure each patient has the best possible result with minimal discomfort and down time. Stephen shares his experience to give the candidates an idea of what to expect. Also, the patient gets a chance to examine Dr. Behnam’s work by examining his new natural hairline and his before and after hair transplant pictures. After the brief meeting with Stephen, you will next meet with Dr. Behnam to discuss your goals and concerns and have a hair loss examination. What is Microscopic Hair Analysis? Using a video microscope, Dr. Behnam analyzes the thinning areas as well as the donor area. He will determine whether you have strong donor hair and whether you are a good hair transplant candidate. If the donor area is not affected by hair loss, the patient is a good candidate for hair transplantation. If the patient is suffering from generalized thinning, the donor area is also thinning and will not be permanent if transplanted. We like to emphasize again why early treatment is so important. Patients with generalized thinning are not good hair transplant candidates. Generalized thinning is just one example of a condition that would exclude a patient from being a transplant candidate. Early treatment is the key and that is why a microscopic analysis of every potential patient is so important. Dr. Behnam uses the Densitometer to determine whether the donor area is of good quality to be used for hair transplantation. In this example, the donor area is of poor quality; its thin in diameter, sparse, contain single hair follcile rather than multiple . The picture above shows an analysis of a patient who has generalized hair loss and thus he has a poor donor hair follicles. Hence he is not a good hair transplant candidate. As you can see, he has generalized thinning of he grafts. 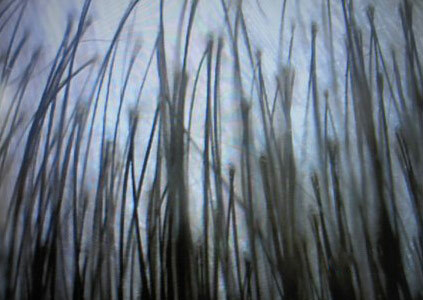 The image above shows a patient with strong hair follicles, demonstrated by thick, dark and black hair follicles without much thinning. 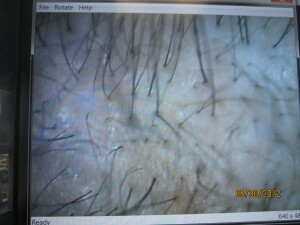 These hairs are great transplant candidates as they are resistant to thinning and are thus permanent. What is Hair Density Calculation? Dr. Behnam calculates the density (number of grafts per centimeter) in the donor area and determines how many grafts he can remove in one session. Most people have between 40 and 80 grafts per square centimeter in their donor area. In the initial meeting, Dr. Behnam calculates the patients’ density in the donor area which will ultimately determine how much of the bald areas can be covered in a single procedure. A person who has 80 grafts per square centimeter will have more grafts to transplant than the person who has 40 grafts per square centimeter in the donor area, and thus a greater balding area can be covered. These measurements give the patient a realistic expectation of what can be accomplished in a single procedure. Often, patients with lower density count realize they can not achieve the results they want and decide not to do the procedure. This is very important. You could only figure out whether you have a poor density by having a density calculation done prior to the procedure. We feel that this is the most ethical way to inform the patient of what to expect. This enables for accurate calculation of the density (grafts per centimeter square) in the donor area. Dr. Behnam maps out how many centimeters of balding areas are needed to be covered on top of the scalp and the number of grafts that are needed. This is done by placing a square centimeter grid (please look below for an example of the hair mapping grid) over the patient’s head and outlining the area to be covered. The area will then be measured. If the area to be covered includes the front and mid scalp area, 25 grafts placed per square centimeter are required to give adequate coverage. Also, if a new hairline needs to be created, 400 grafts are usually required for the hairline (actual amount may vary depending on the size of the patients head). If the area to be covered is the crown area, 35 grafts per square centimeter is required to cover the area. The crown requires more grafts because it is normally viewed from the top looking down revealing the space between each graft. So, lets say the hair mapping process has indicated that a patient has 50 square centimeters to be covered in the mid scalp area and also needs a new hair line. We would multiply 50 times 25 to determine that the patient needs 1250 to cover that area. Add 400 grafts for the hair line and we determine that the patient needs 1650 grafts to fill the area with adequate density. 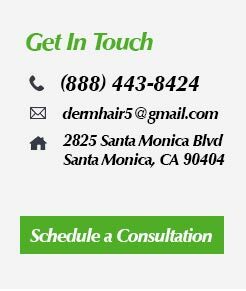 The hair mapping grid enables Dr. Behnam to calculate how many square centimeters you need to fill and thus how many grafts you require for the entire area. The drawing on the grid indicates the bald area needed to be covered with hair.